Beds have three standard dimensions. The dimensions of single beds are: 90x200cm, 100x200cm, 120x200cm and they allow only one person to sleep comfortably. In the case of two person beds the dimensions are: 140x200cm, 160x200cm, 180x200cm, 200x200cm. The dimensions which are presented in such a manner always relate to the inner diameter - the part where the mattress goes. The eternal dimensions of a bed are always a couple of centimeters higher than the nominal dimensions "for the mattress" - this depends on the design and construction of a given model. Half of our clients who decide to buy a 160x220cm bed as this allows them to position the bed in most rooms and allows two people to sleep comfortably. Of course, it is possible to order furniture with nonstandard dimensions but you must remember that this may cause problem when looking to your own base and mattress. 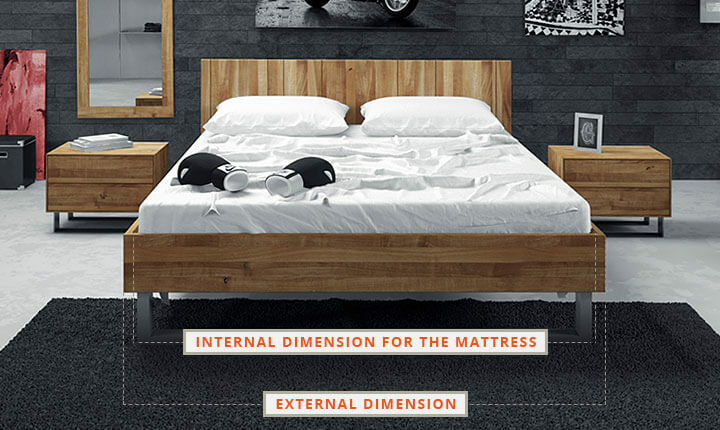 When picking a good base and mattress on your own you should remember that the inner dimension is different smaller then the external one by the thickness of the material. Both dimensions are given on the webpage of the product so that the client is fully aware of what he or she are buying. When you want to buy, it is best to contact our sales expert who will help you choose the right base and mattress. SHOULD I USE TWO MATTRESSES IF I USE TWO BASES? • the height of the base. The maximal width of most bases is 120cm and that is why you need to use two bases for beds which are wider than this. They can be freely used thanks to a middle support strip which is supported by two legs. A comfortable mattress will ideally fit your body. But how to choose the right one from such a multitude of products? We will gladly help you choose a mattress and base. Please contact us.